We are grateful to Lord Hunt for his invitation to visit Arundells, the former home of Sir Edward. 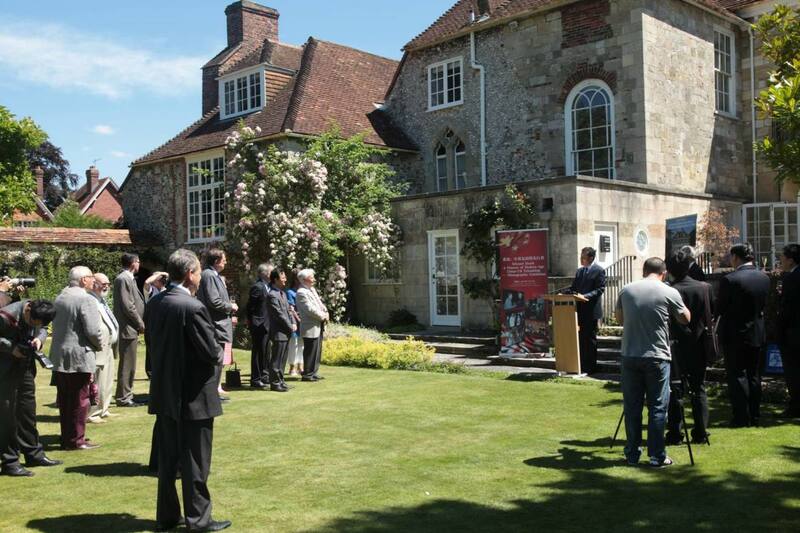 We have come to Arundells House with feelings of reverence for Sir Edward Heath made great efforts during his life to build deeper understanding and friendship between China and the UK. We wish to thank Lord Hunt for his very warm welcome. We are grateful for his fellow trustees for joining us today. We also thank the journalists from local and faraway places. This is my first time here. But, I heard a long time ago about Arundells being a most beautiful house in Britain. “This must be one of the ten most beautiful views in Britain”. Sir Edward Heath was by any measure a legend. To British people, he was a Prime Minister, a Tory leader and Father of the House. Possibly most significantly, he led Britain into the European Economic Community. Sir Edward was also a fighter against appeasement and in the military during the Normandy Landings. Outside politics, he was a musician of near professional standard and a world-class yachtsman. For most people it would be a severe challenge to accomplish any one of these achievements. Yet Sir Edward was worthy of all the titles. Sir Edward’s premiership oversaw the establishment of ambassadorial diplomatic relations between China and the UK in 1972. This launched a new era of relations between our two countries. Since 1974 Sir Edward visited China 26 times during the following 27 years. After the famous British scholar Dr. Joseph Needham, he was the second British person to be awarded ‘People’s Friendship Envoy’. This is the highest honour of people-to-people diplomacy that China ever gives to a foreigner. Sir Edward was also the last foreign politician who had met the three Chinese leaders: Mao Zedong, Zhou Enlai and Deng Xiaoping. Forty years on, the China-UK relationship, launched by Sir Edward together with Chinese leaders, has gone through a sea change. · In 1972 China-UK trade was merely 300 million US dollars. · Last year the figure was more than 70 billion US dollars. · It is expected to pass 100 billion US dollars by 2015. · By the end of last year, mutual investment had exceeded 50 billion US dollars. · Chinese investments were more than 32 billion US dollars, making up over 60% of the total. · China-UK people-to-people exchange is flourishing. · The number of people visiting each other’s country has surged from 200 in 1972 to more than one million last year. · The number of Chinese students in the UK has leaped from 16 in 1972 to the current 130,000, only second to the USA. In June this year Chinese Premier Li Keqiang paid a successful visit to the UK and held the annual summit with Prime Minister David Cameron. The two leaders agreed to build a partnership of common growth and inclusive development. They drew up a blueprint to further deepening the China-UK Comprehensive Strategic Partnership. In that spirit China never forgets the contribution of old friends. 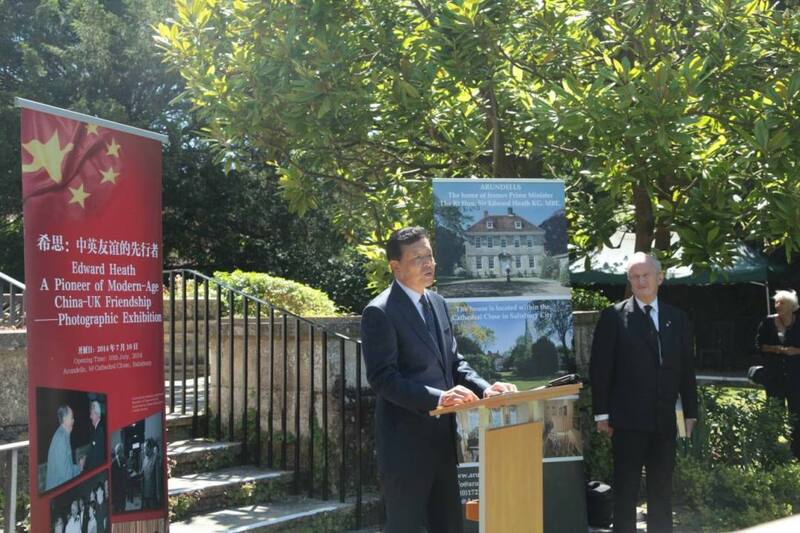 · Of course such true supporters include Mr. Stephen Perry and Mr. Peter Batey who, over the past decades, have never ceased their efforts for a single day to promote China-UK friendship and cooperation. In the era of globalisation, China’s links with the rest of the world are becoming ever closer. China has made many new friends in different countries and different sectors. But we have not, and will never forget these old British friends. They made a historic contribution to China’s development, to China-UK relations and to connecting China with the rest of the world. Friendship has escorted China-UK relationship and partnership a long way to where it is today. Friendship will remain essential to the healthy and stable development of China-UK relations in the future. The purpose of my visit today is to build on this friendship and promote greater China-UK cooperation. For that reason we have brought a number of photos recording both Sir Edward’s contacts with China and some historic moments in China-UK relations. We will donate these photos to you and hope they will enrich the collection of Arundells House. I also hope that my visit today will go further to generate interest among Chinese and British young people. I want them to visit this beautiful part of England and be inspired by the memories that never fade and the feelings that never change. That will encourage them to join the cause of China-UK friendship and cooperation. With their participation, we will write a new and even more glorious chapter of China-UK relations.